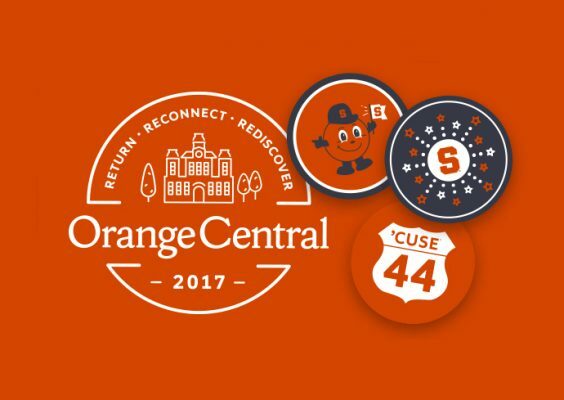 With a record-setting number of registrants, excitement is growing for Orange Central, Syracuse University’s annual homecoming and reunion celebration. More than 50 exciting and engaging programs are planned, and there truly is something for everyone. In addition to class reunions, special affinity reunions are planned for members of University 100, University Union, Remembrance Scholars, past student-athletes, former Ottos, and fraternity and sorority alumni. Arents Awards Celebration: The George Arents Award is Syracuse University’s highest alumni honor. The 2017 recipients are: Tom Coughlin ’68, G’69, a decorated National Football League coach; Daniel A. D’Aniello ’68, co-founder of a successful global asset management company and a committed philanthropist; Diane Nelson ’89, president of DC Entertainment and Warner Bros. Consumer Products; and Mary Spio ’98, a pioneer in digital cinema and virtual reality. ’Cuse Cookout on the Quad: A fun evening for the whole family on the Quad, featuring fall-themed food and beverages, a photo booth, games and a DJ. Orange Central Tailgate: Get ready for the Syracuse vs. Pittsburgh football game by enjoying delicious food and drinks on the Quad. The family-friendly event will feature great Syracuse giveaways, a photo booth, a visit from Otto and a performance by the SU Marching Band. Syracuse vs. Pittsburgh football game: The Syracuse University Alumni Association sold out of its allotment of tickets in the Orange Central Cheer Section, but tickets are still available for purchase through Ticketmaster and the Carrier Dome Box Office. Milestone Reunion Celebrations: Milestone reunion celebrations are planned for the Classes of 1957, 1967, 1992, 2007 and 2016. Online registration for the weekend is now closed. In-person registration will take place in the Goldstein Alumni and Faculty Center Thursday, 2-8 p.m.; Friday, 9 a.m.-9 p.m.; and Saturday 9 a.m.-5 p.m.
To see the entire list of events, visit http://orangecentral.syr.edu.